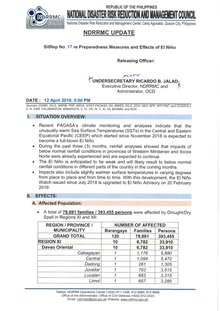 Drought conditions are being reported in the MIMAROPA Region, Region IX, and Region XII, BARMM and Metro Manila, where ten provinces have declared a State of Calamity according to the National Disaster Risk Reduction and Management Council (NDRRMC). 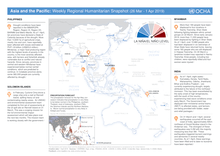 While [PAGASA] declared a weak El Niño lasting until June, agricultural regions are suffering from its worsening effects, with the Department of Agriculture (DA) reporting damage to over 13,600 ha of agricultural crops, mostly rice (81 per cent) and corn (19 per cent). 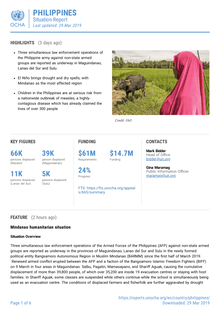 Agricultural losses are estimated at PhP1.33 billion (US$25.6 million) but could run higher as the DA verifies reports from regional offices. Over 16,000 farmers and fisherfolk are affected, and some local media are reporting that the drought conditions are also starting to affect livestock, with some farm animals dying due to the lack of grass or hay for foraging. 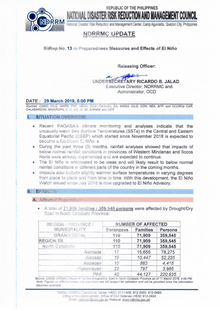 ILOILO CITY, April 20 (PIA) -- More than P1 billion worth of damages in crops, fisheries, poultry, and livestock have been reported due to the dry spell brought by the El Niño phenomenon in Iloilo province. 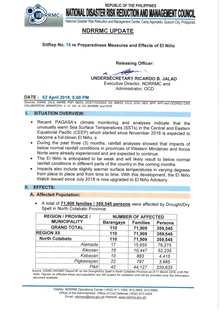 In the Provincial Disaster Risk Reduction and Management Council (PDRRMC) emergency meeting held April 17, PDRRMC executive director Jerry Bionat said a total of 47,985 farmers in the province are affected by the damages that amounted to P1,137,462,840.00 because of El Niño. Recent PAGASA's climate monitoring and analyses indicate that the unusually warm Sea Surface Temperatures (SSTs) in the Central and Eastern Equatorial Pacific (CEEP) which started since November 2018 is expected to become a full-blown El Nino. 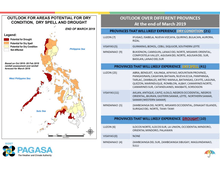 During the past three (3) months, rainfall analyses showed that impacts of below normal rainfall conditions in provinces of Western Mindanao and Ilocos Norte were already experienced and are expected to continue. NAVAL, Biliran, Apr. 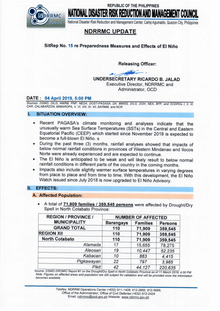 15 (PIA) -- The Philippine Atmospheric, Geophysical and Astronomical Services Administration (PAGASA) report on the sectoral impacts of El Niño was presented recently during the emergency meeting of the Biliran Provincial Disaster Risk Reduction and Management Council (PDRRMC). 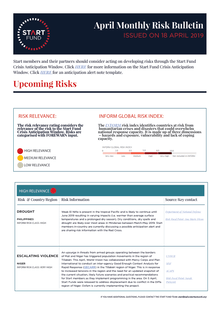 The El Niño phenomenon is expected to bring impacts or effects on the areas of agriculture, water resources, marine resources, human health and environment. • Recent PAGASA's climate monitoring and analyses indicate that the unusually warm Sea Surface Temperatures (SSTs) in the Central and Eastern Equatorial Pacific (CEEP) which started since November 2018 is expected to become a full-blown El Nino. 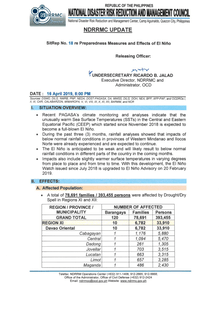 • During the past three (3) months, rainfall analyses showed that impacts of below normal rainfall conditions in provinces of Western Mindanao and !locos Norte were already experienced and are expected to continue. PILI, Camarines Sur, Apr. 8 (PIA) – After Camarines Sur Governor Miguel Villafurte declared a State of Calamity in the province early this March due to the reported damage to crops and farmlands in various parts of the province and the impending threat of El Niño phenomenon in the agricultural sector, the Provincial Disaster Risk Reduction and Management Council (PDRRMC) re-convened heads of government agencies to discuss possible measures to lessen the ill effects of the said weather phenomenon. Elderly farmer Avelino Jacinto surveyed a field that was once covered in greenery, but had recently transformed into a patch of cracked earth. Jacinto, 73, was staring at the early impacts of El Niño, a weather phenomenon that causes warming of sea-surface temperatures in the Pacific, which could unleash droughts and shrink the economic performance of one of Southeast Asia’s robust economies. The Department of Social Welfare and Development (DSWD) assures local government units (LGUs) that is has enough relief supplies to augment their resources for their constituents who are affected and will be affected by the drought prevailing in the country. 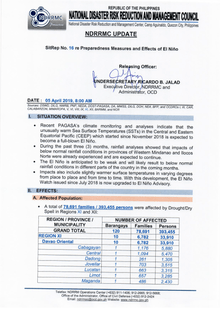 • During the past three (3) months, rainfall analyses showed that impacts of below normai rainfall conditions in provinces of Western Mindanao and llocos Norte were already experienced and are expected to continue. DAVAO CITY, March 28 (PIA)- Acting City Treasurer Erwin Alparaque of this city government assured that funds will be ready once the City Mayor declares a state of calamity due to the long dry spell. Alparaque said the city has enough funds to provide the basic services to the people when worse comes to worst. Speaking in the Information-Speak Forum, he said that aside from the income generated from tax collections, fees and charges the city has also its Internal Revenue Allotment (IRA). 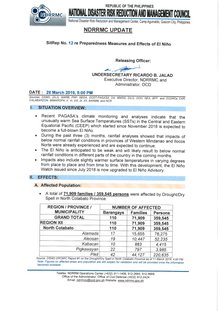 • During the past three (3) months, rainfall analyses showed that impacts of below normal rainfall conditions in provinces of Western Mindanao and llocos Norte were already experienced and are expected to continue. 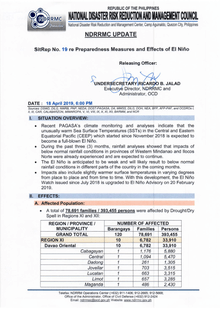 CEBU CITY, March 26 (PIA) –- The early onset of El Niño has already affected the crops and dams in Central Visayas. The Philippine Crop Insurance Corporation (PCIC) here reported that the heat wave has affected 672.53 hectares of crops while the Metropolitan Cebu Water District (MCWD) said dams in Central Visayas are drying up.